House & Garden’s Roots Excelurator is a unique formulation. Use at 1.1ml per gallon. Ammonium Nitrate and Potassium Hydroxide. 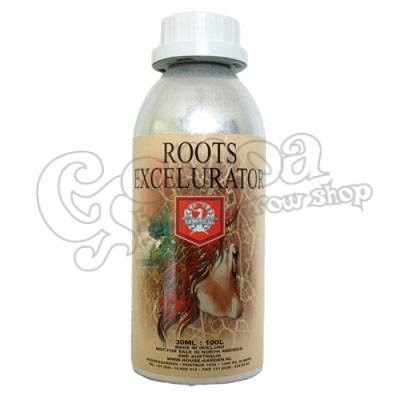 Roots Excelurator is the top show piece in the House and Garden line of nutrients. It’s exact formulation is a well kept company secret. House & Garden maintains their own nutrient manufacturing facility as well as their own laboratories where they continually test each batch of fertilizer they produce. This ensures that gardeners employing House & Garden receive high quality, consistent products. Add 1.1 ml of Roots Excelurator to every gallon of water in the nutrient solution. Refer to feeding chart for detailed usage instructions.